This book is part of a comical series, about a very overactive, highly imaginative, gutsy, and adorable lady, who has your sides hurting from laughing so much. Grandma always dusts her wrinkles and dons her glasses and puts in her teeth before leaping out of bed unashamed to wear outrageous clothes. In this case even shorts is worn to take in the sights of London while she is on holiday to see the Changing of the Guards. Any type of transport will do for Grandma such as skateboards and tea trolleys to name a few. With the colourful drawings by Craig Smith I felt like I had leapt into another world , when after having tea together, even the Queen joined Grandma handgliding over the London Bridge. 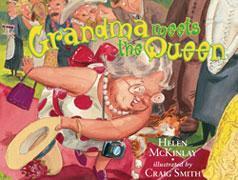 Each page brought a new day of hilarious adventures, and when the Queen becomes unwell from an overdose of cucumber sandwiches, she bestows the title of Queen on Grandma for a day. What a sight to behold as Grandma …*clears throat* that is Her Majesty is seen absailing down the palace walls. I laughed when I read Grandma had donned a wetsuit and flippers and then proceeded to plant her cabbages in her garden. When the team refuses to get up to play their rugby game and the coach asks for her help she takes the Team white water rafting, not to mention riding the dodgems and walking tight rope in a circus. A day of fun is what is in order says Grandma. When the Captain has chicken pox on the big day of the test this active lady saves the day and joins in scoring a try. Like us, the All Black team love her and she is always rewarded with breakfast in bed and a get together. Deciding to take the day off from being a good Grandma (now that can only mean trouble… well, I thought so! ), throwing her knitting out the window she decides to spend the day sitting in an oak tree until its time to come in, then parachutes down. When she climbs the town hall she assures the towns people not to worry as she has bought her portable handglider to use. Another day finds her climbing Mt Cook (highest peak in NZ) and skiing down it, and going bungy jumping. Another day sees her pedalling her mountain bike to catch the 12.30 rocket to the moon, arriving back on Sunday in time to get up and make marmalade jam on Monday. One is totally exhausted with laughter at the antics of this sweet lady and the cleverly painted drawings by Craig, expose so much more. 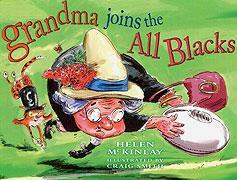 These are 3 of a series of 4, the other one *Grandma’s Kiwi Christmas” are cleverly written by Helen. With laughter children are lead through some of New Zealand’s iconic places and culture, never missing a beat she keeps the intrigue of what is happening next with each page turn. 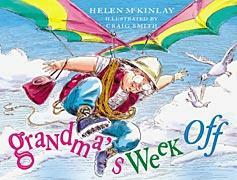 Helen has certainly captured a child’s attention and imagination here and no one young or old could put down one of these books without a smile on their face or giggle. Helen herself enjoys writing besides children’s books, poetry, and enjoys sharing her poetry through performance. She has a monthly session of live poetry “Poetry for Pudding”, at a Borders Bookshop in Christchurch. Among her varied activities she also had the opportunity to organize, record and host a community radio program that showcased local writers. I loved these adorable books and they are available in most NZ Postshops. The publisher of these books is Harpercollins – http://www.harpercollins.co.nz/ these books are also attainable through the following websites: http://www.whsmith.co.uk/ , http://www.fishpond.co.nz/ , http://http//www.wheelers.co.nz to name a few. This entry was posted in Children's literature, Picture book, Picture Book Review and tagged Art, Book, Children, childrens literature, Christchurch, London, New Zealand, Shopping. Bookmark the permalink. Wow, this is the wild, whacky Grandma that kids would love to have. I love the Kiwi focus: rugby, royal family, Mt Cook etc… This works because though our protagonist is old in years, she is clearly very young of heart and spirit. Have you ever been to any of her Poetry for Pudding sessions, Diane? Yes she is the most wackiest Grandma ever, but you gotta love her getup and go attitude, and I thought such an ingenuious way to bring cultural focus to children. No I have not been to any of her Poetry sessions, would love to go though, maybe oneday.